so it's with pride and joy that we share these lovely moments with you. Susanne & Stefan got married in Brixlegg and Kamsach, near the romantic lake "Reinthaler See', Tyrol, Austria, on a rainy day in September. Susanne wore a simple, but beautiful dress by Marylise, a bridal label from Belgium. To make her style more glamourous she decided to wear our delicate Scarlett dance shoes with it's multiple panels & satin plaited t-bar. We think despite of the rain they look so happy and full of love! What a gorgeous couple! Susanne: "I really still love my shoes and they were perfect to wear, like slippers ;) luxury slippers. I was looking for extraordinary shoes to pimp up my style. It was love at first sight, when I found this beautiful and unique shoes on Pinterest. It was extreamly easy & uncomlicated to order the shoes per email. Perfect and confortable shoes for a unforgettable day with my big love Stefan. Thank you so much for everything." Shirey & Bruce had a fabulous wedding last October in San Diego, CA. I am very pleased to share a few of her favourite photos with you, we will post more on our blog very soon. Her lovely off the shoulder lace dress, called Emma, is from Maggie Sottero. She paired it with our cute, caged Karis kitten heel sandal. The low heel meant it was prefect for all day wear and even worked during their shoot on the beach against that gorgeous sunset! I am a sucker for a sunset on a beach and absolutely adore these pics. Congratulations! Dana chose our classic satin & glitter t-bar dance shoe Scarlett. 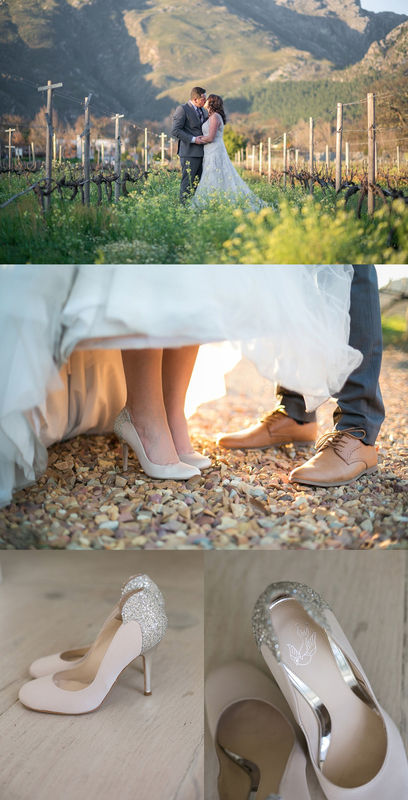 Dana: "The shoes were all I could ask for on my wedding day: sparkly, comfy and with the right height to move around jauntily. For every bride-to-be, I can totally recommend a shoe that does not only fit the dress but also one that you can wear all day long without having to change into the emergency ballerinas when the party is in full swing. For me the Scarlett shoes definitely did the trick." Kathleen Simpson & Conor Daly got hitched on the 1st of December in a tropical Key Largo, FL. at Key Largo Lighthouse. They had a stunning beach wedding, set perfectly against palm trees and a sparkly ocean. Kathleen wore our delicate t-bar Carmen glitter sandal. It looked perfect with her fabulous Essence of Australia dress, purchased at Something Blue Bridal in Schereville, Indiana, USA. Kathleen: "After getting engaged to my favorite man I knew I would need to find the perfect wedding shoes. I was looking for something comfortable, stylish and unique. Love Art Wear Art was a dream come true!" she also ads "The customer service team has also been so personable and friendly, I'm truly so happy I found your company and was able to wear your shoes. It felt extra special- I'm an artist and art therapist so I loved everything from the name to the shoes themselves with the number on the back - it was all perfect!" Our lovely bride Regina was married in August last year. She wore a beautiful long sleeve lace dress from the German boutique, Sincerity. Her very unique and fabulous pheasant feather tiara is from Holly Young Boutique in Cornwall. Same as with the shoes, she saw it and fell in love with it. She chose our Karis kitten heel sandal. It has caged gold glitter upper and a delicate ankle strap. Regina: "The shoes were absolutely perfect on my wedding day. My glittery gold sandals made me feel extra special and they were super comfortable all day long (we danced through the night until 6 am and the shoes stayed on!)" For their wedding last summer, Amy chose a lovely peach tone vintage, 1920s dress that came from Dirty Fabulous in Dublin. To contrast the colour of the dress, Amy wore our pale blue suede & glitter Carmen sandal with the matching Lucille bag. Her lovely wild flower bouquet came from Herbert & Isle. 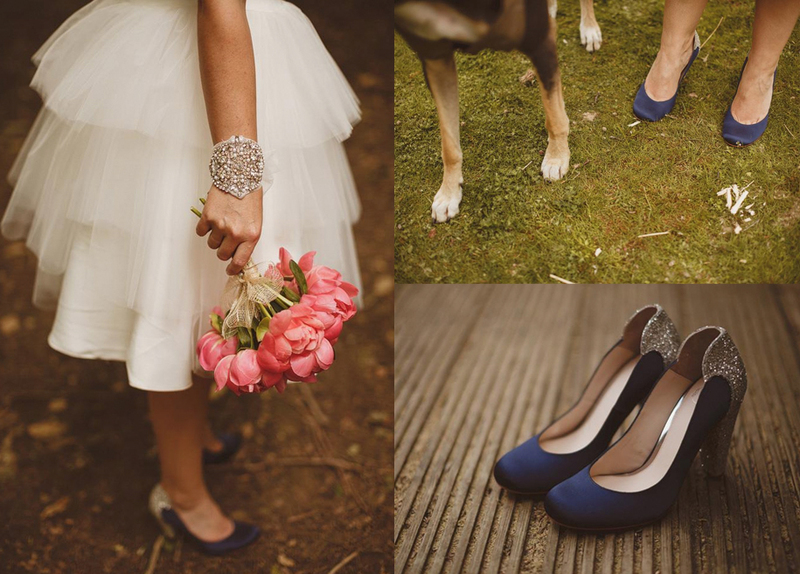 Amy: "The wedding was amazing and the shoes really made an impact! From the comfort level to the many comments from tiny nieces who couldn't stop starting at the sparkles to my mam who was impressed I managed to dance so long into the night in them! I also wore them last weekend as a bridesmaid and again, loved every minute of them. They are so special." Nicola & Paul had an amazing and sunny wedding day this summer and I am very pleased to share a few of Nicolas favourite snaps with you. The lovely scalloped edge Bardot style dress is from Daughters of Simone from our favourite East London bridal boutique, Heart Aflutter. Nicola chose our scalloped edge platform Anoush peep toe wedding heels to compliment the dress beautifully. She says "I've actually worn the shoes a few times since the wedding! They’re wonderful!!" I have a beautiful and moody Italian wedding to share with you. I adore the soft grainy feel of these photos. Our lovely bride, Marta Dallaglio, is now happily married to her handsome groom Giuliano Balestreri. The wedding was in Bonassola, Italy, on the 10th of September 2016. Marta wore our cream & glitter Scarlett t-bar dance shoes and I am pleased to hear she thought the shoes where AMAZING! 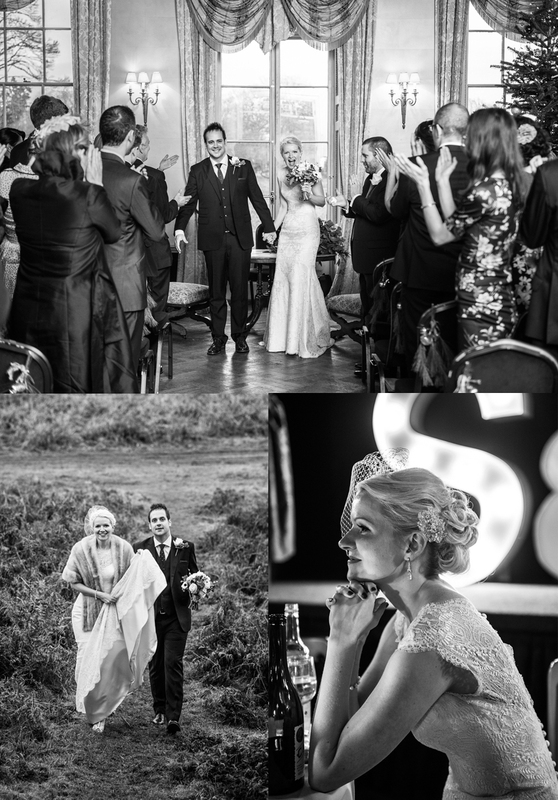 Big thank you to Marta for sharing these lovely photos with us, photography by Sebastien Boudot Photography. For more pictures you can have a look at our blog. I am originally from South Africa and when we got married it was in a little forest on a a wine farm near Stellenbosch. Skip forward a few years to this winter, my cousin Francois got married to the lovely Janine and they had their wedding in Franschoek on a perfect sunny winters day. These photos not only reminds me of my wedding day in the scenic winelands but its extra special to see my cousin all grown up and so in love! Francois & Janine's wedding was at The Conservator in Franschoek. This stunning venue has a modern but typical South African atmosphere and I adore all the natural details and the rustic modern vibe. Janine wore a beautiful beaded ivory lace gown with a silver beaded belt. She chose our ivory & glitter Lara round toe court shoes. I think she looked stunning! For more photos you can go to our blog. Lovely Ciara and John were married on the 4th June 2016 at the Holy Name of Mary Church in Middlesbrough. The happy couple had their reception at Hutton Rudby Village Hall. Ciaras lace back detail dress was by Maggie Sottero and she styled it with our cream & glitter Scarlett t-bar dance shoes. Ciara: "The wedding was perfect and I absolutely loved my shoes, in fact I have worn them to two weddings I have attended since my own!" Laura & Julio met in NYC, where they currently live. He's originally from Santiago, Chile, and Laura from Lima, Peru, and since most of their family members live in Lima and Santiago, it made sense to have their wedding there. They got married on July 23rd at Parroquia Nuestra Señora del Pilar in San Isidro. They love its neo-colonial style and the extremely beautiful altar, made in carved wood and covered in gold leaf. It is also just around the corner from the park where Julio proposed! Laura got her wedding dress at Angelique Bridal in NYC, it was from Essence of Australia. She paired it with our classic ivory & glitter Scarlett t-bar dance shoes. Laura: "We danced literally all night long, from 8:00pm to 4:00am and I'm so glad I picked the Scarlet Ivory T-bar dance shoes. They were amazing, not just beautiful and the classic style I was looking for, but they were also extremely comfortable. They were perfect! Thank you so much!" We will be posting more pictures and supplier details on our blog. We have had a busy summer that took LAWA bridal shoes to some far flung & exotic shores. As a big fan of Mexico myself, I am pleased to share this fantastic wedding with you. 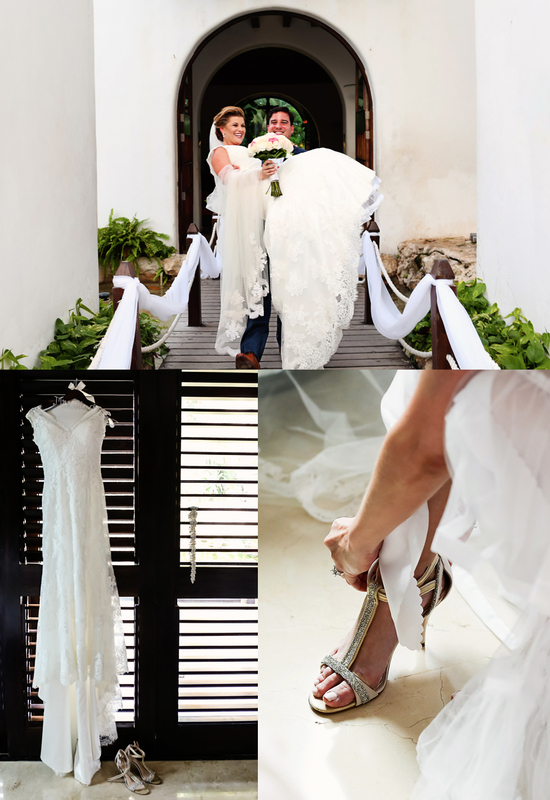 Renee & Todd got married in Playa del Carmen, Mexico on April 9th and it looks like they had a brilliant day. You can view more photos from the reception & beach party on our blog. Renees wedding dress was made by Maggie Sottero and she wore her mother's veil (37 years old)! Her lovely embellished belt was borrowed from her best friend. The shoes was something new and is our classic Carmen glitter t-bar sandals, Renee: "I loved the shoes. Comfy and chic!" 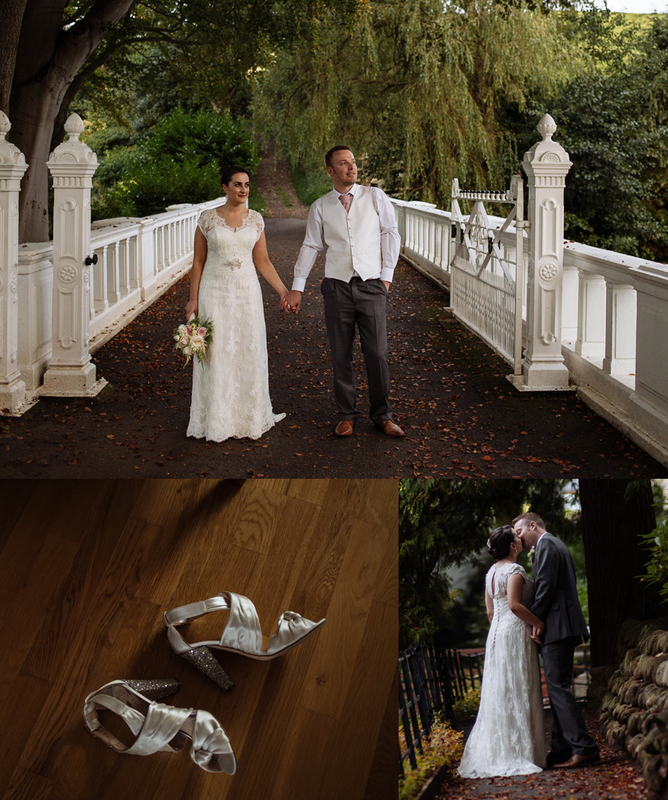 Justine and Derek had their summer wedding this August at the lush Leixlip Manor and Gardens in Ireland. 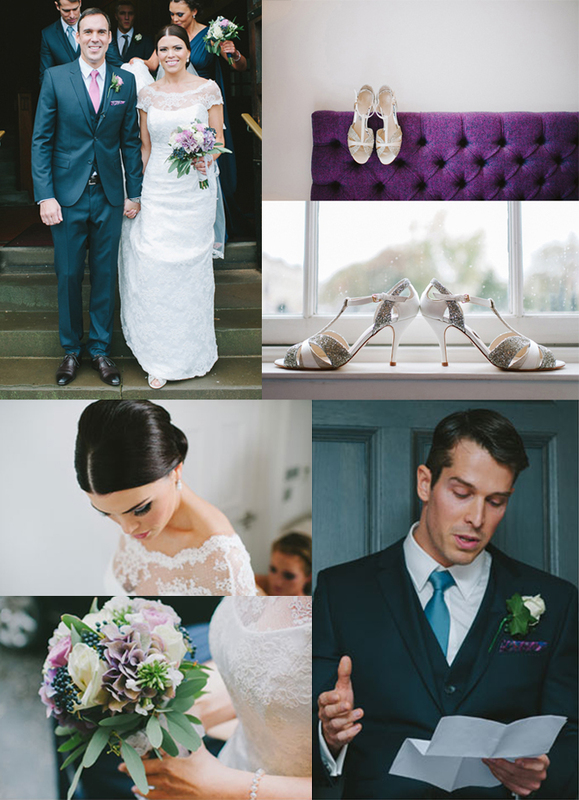 We are delighted to share this peek into their fabulous wedding day. Justines wedding dress was by Monsoon, her hair by by Michelle O'Halloran and her make up by Lyndsey Cavanagh. The lovely calf length dress was perfect to show of our cream & glitter Scarlett t-bar dance shoes. For more pics and LAWA real brides you can head over to our blog. Ann-Marie & Stephen had their wedding at the stunning Mount Druid, Castletown geogehan in Co. Westmeath, Ireland. The photographer was Pawel Bebenca and the photos are stunning! Ann-Marie sent me such a great selection, it was really hard to choose which ones to use. I will be sharing the rest on our blog so if you want to see them just click here. She wore a gorgeous lace dress with a cap sleeve detail and a long sweeping vail which she teamed with our jade Anoush suede platform peep toe sandals. Their bright colour really stood out, I love her bold styling! Ann-Marie: "I bought my wedding shoes before I had finalised my dress. I loved the shoes so much and I got to bring them to every dress shop and every fitting so they were well broken in by the wedding! Luckily that was the case, because the sun was shining so we walked around the farm where we got married and got some fantastic shots. The shoes just pop and everyone loved them! I need to get them cleaned and they will be ready to go again! " Norway in the sunshine looks glorious! 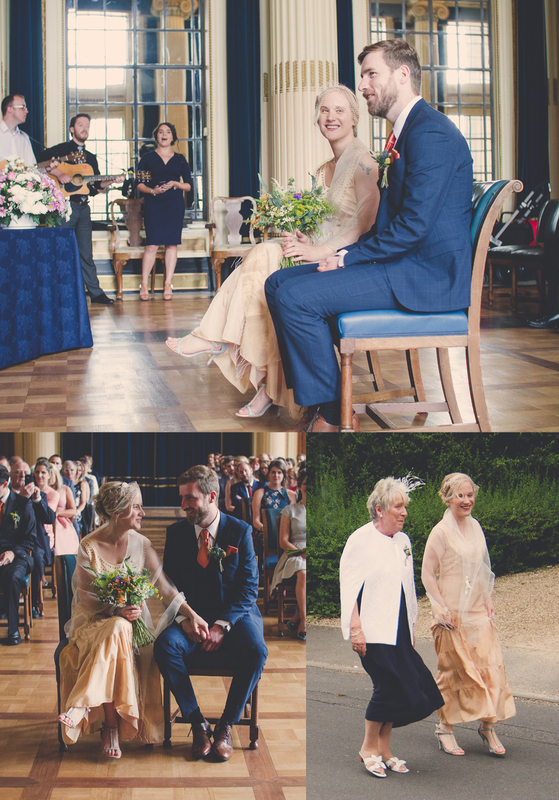 Big thank you to Hilde for sharing these lovely pics of their wedding day with us. They got hitched in Norway this August, Hilde chose our classic Scarlett glitter t-bar dance shoe to wear with her beautiful off the shoulder lace & chiffon gown. What a gorgeous bride and beautiful day! For more pics and LAWA real brides you can head over to our blog. 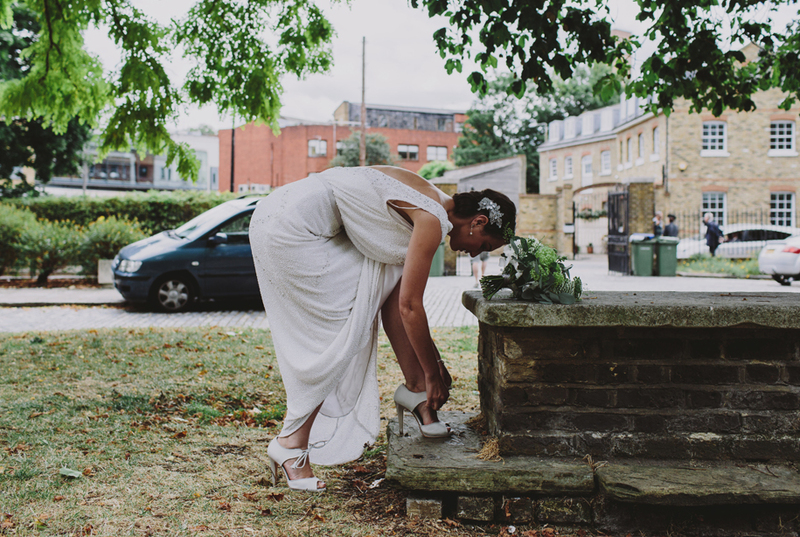 As a Londoner I love seeing an elegant urban wedding and Katie and Toms was just that. It was such a fabulous affair that it has been featured on Rock My Weddings blog. I would like to share a few of my favourite photos but for the full post head over to the blog. 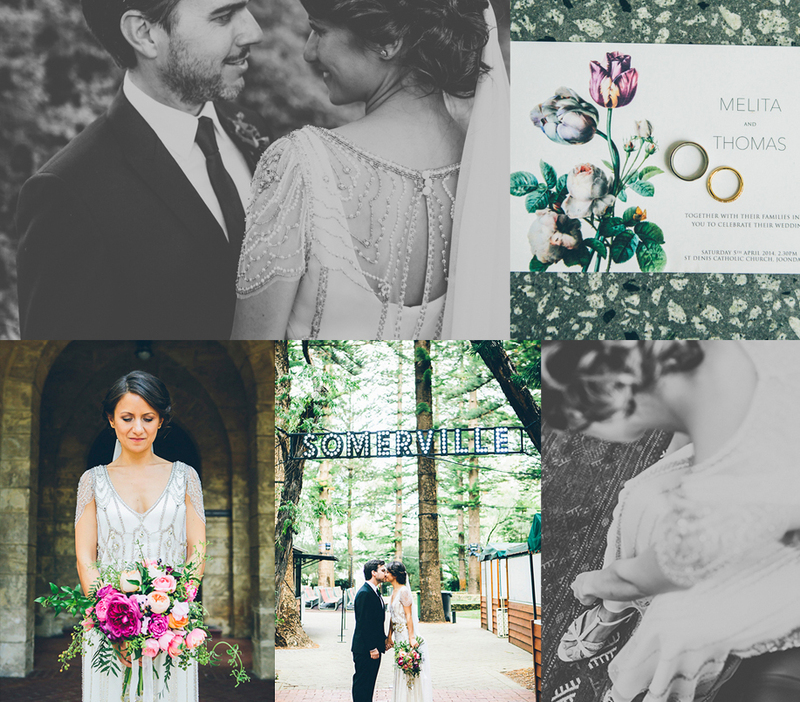 The beautiful photos are by the photographer Hearts On Fire, the vintage gown from Elizabeth Avey & high street bridesmaid dresses and groomsmen suits. 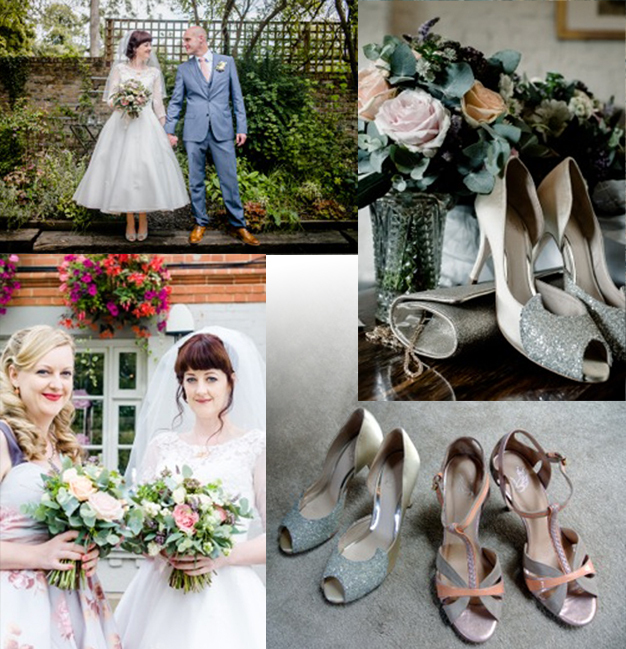 Our cute round toe court Lara, in blush satin & silver & glitter leather looked great with the dress and in the lovely green, blush & gold colour scheme. Katie: "I wore handmade heels from Love Art Wear Art. I originally wanted a green pair, but when I stumbled across these I couldn’t resist! A thick heel was essential for me, for both comfort and to ensure I didn’t damage the lace on my dress, and the sparkle was a bonus!" Danielle and Josh had their wedding in the green and leafy Greenwhich. Danielle wore a beautiful beaded gown by Charlotte Wilden Bride. She teamed this elegant dress with our Anoush white & silver suede platform peep toe sandals. 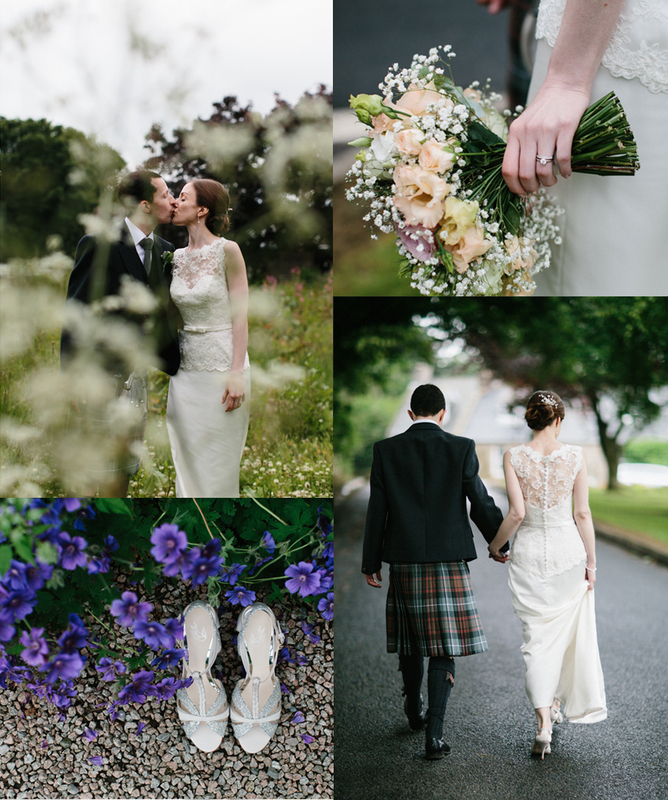 Rory Craig and Catriona Allan were married in Udny Green, an idyllic village in Aberdeenshire, Scotland. The marriage ceremony took place at Udny Parish Church which is located beside the traditional village green. A reception was held in the village hall hosted by Eat on the Green, a Two AA rosette restaurant located in Udny Green. Their special day was captured by Caro Weiss, a contemporary wedding photographer based in Glasgow, Scotland. Catriona wore a simple, formal bridal gown with a high floral-patterned lace neckline and subtle fishtail train. The dress, called ‘Imogen’ was designed by Scottish wedding dress designer, Joyce Young. The look was completed with our Scarlett ivory satin & glitter t-bar dance shoes and Rowan hair comb. Anneka & Luke was married in Tunbridge Wells on the 23rd of May 2015. The photographer is Ed Peers Photography. Anneka wore a bespoke pair of our Lara cone heel courts. These cute round toe court shoes are fabulous for outdoors weddings, the heavy cone heel won't sink easily into the grass or soil. Her fab dress is from Rock The Frock Bridal Boutique. 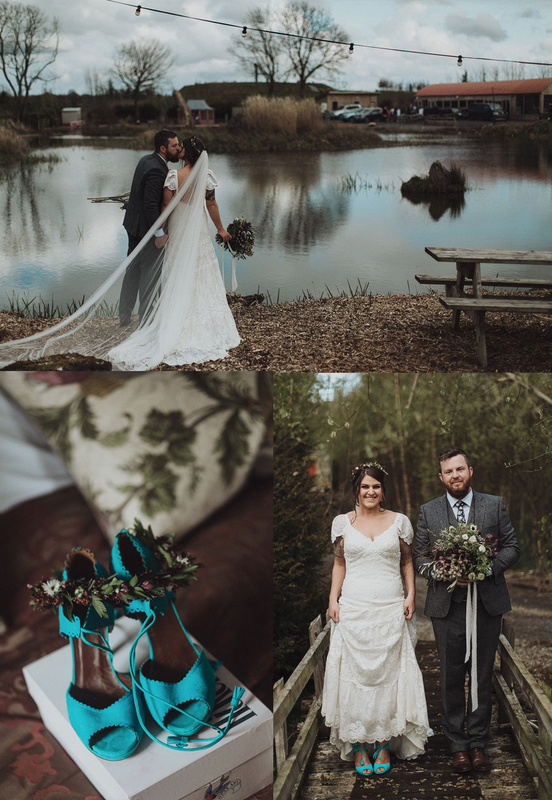 Anneka is a wedding videographer and you can see her eye for detail and her great colour palette choice in these fabulous pictures! Anneka says: "I LOVED my customised shoes by Love Art Wear Art, thanks to Nicole she got them made in the exact colour that I wanted!" Serena and Ronan married on the 5th of June, in Youghal Co.Cork Ireland on a lovely sunny day. We are so pleased to share these happy and pretty moments with you. The colour scheme was light, bright and pastel with touches of bright green that really looks lovely. And how awesome is their wedding car? I think I have just fallen in love, so cute! Serena wore a beautiful floral lace dress with our Scarlett Ivory satin & glitter, plaited t-bar dance shoes. She kept her accessories to the minimum with classic pearl drop earrings & necklace and a large flower in her hair. Spring time perfection! Serena: "Thanks for everything, I absolutely adored the shoes." Gemma & Chris was married on Friday the 3rd of April. 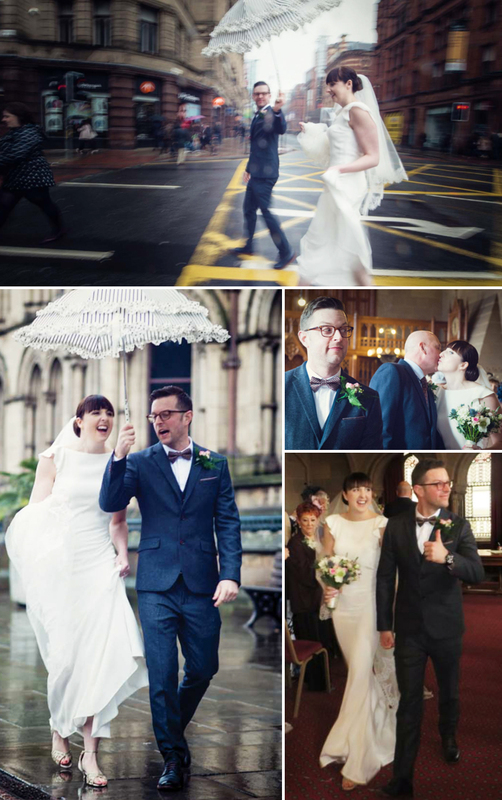 The ceremony was held at the Manchester Town Hall and the reception at the Great John Street Hotel. Gemma wore Karis, our cute, kitten heel sandals. This caged glitter sandal is perfect if you are looking for an elegant but low heel bridal shoe. Gemma says: "The shoes were exceptionally comfortable, fantastic to say, I did a bit of walking in the Manchester rain and danced the night away! I loved them!" Dave and Lindsay had a picture perfect wedding day. They chose to marry at Newton Hall at Newton by the sea, a remote little village on the Northumberland coast. Lindsay wore a stunning Jenny Packham gown called Willow, and her headpiece was created by Gillian Million and she finished her look with our fab Scarlett Ivory t-bar dance shoes. These lovely photos are the work of the very talented Cat Hepple Photography. Fiona & Simon tied the knot at the Lough Erne Resort, Enniskillen, Northern Ireland on the 21st of June 2014. 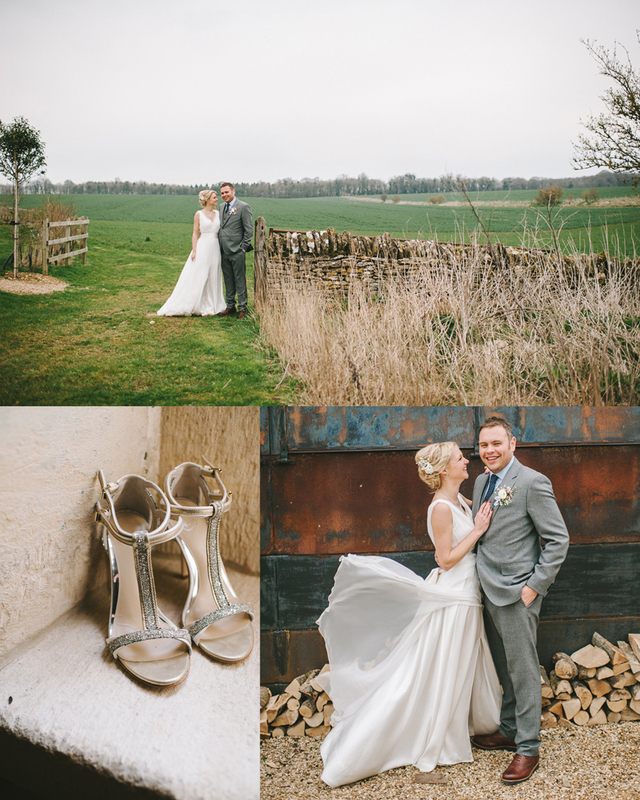 Fiona looked stunning in a Maggie Sottero dress. She wore it with our Carmen Cream sparkly t-bar sandal. She looks gorgeous in this happy picture with her lovely bridesmaids. I am loving the beautiful pale lilac dresses, very tasteful and beautiful! This lovely couple is Emma & Luke. 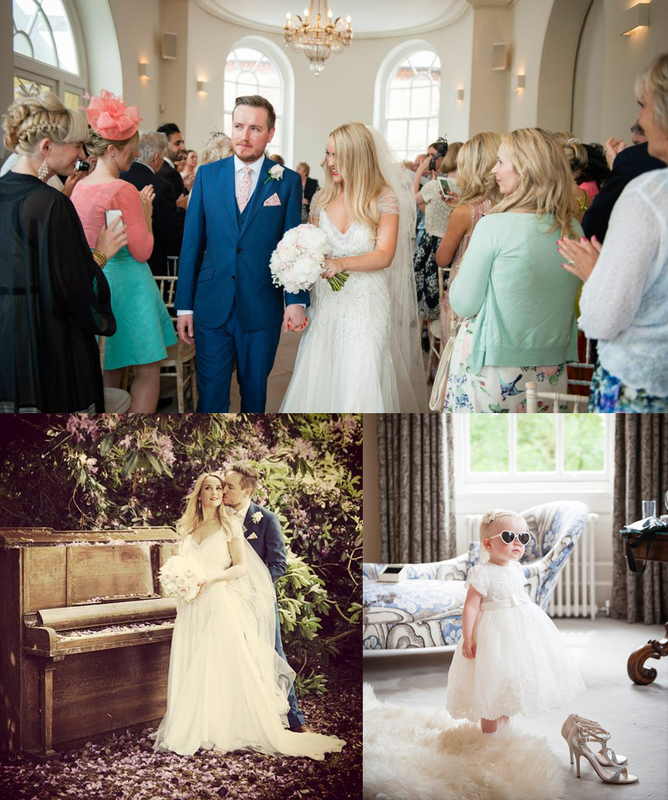 Their wedding was on Saturday 14th June 2014, at Burgh House in Hampstead, London. It was a lovely day surrounded by their closest family and friends. 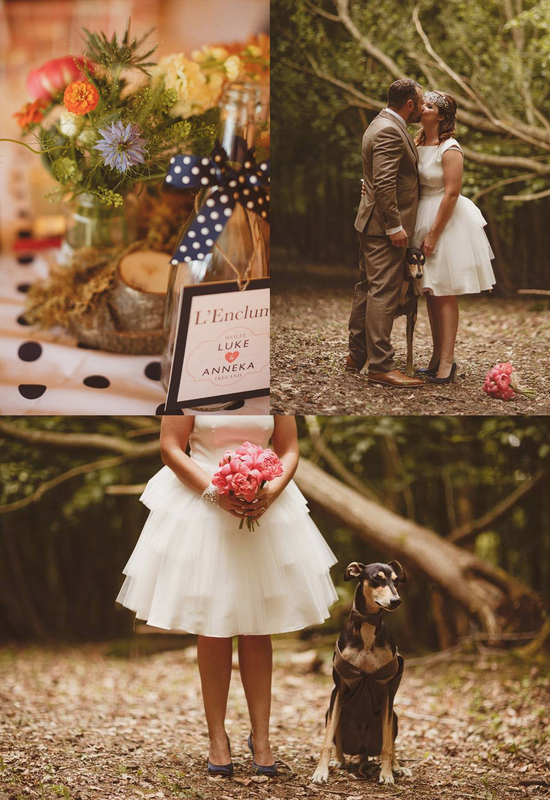 We love Emmas romantic bridal styling. Her lace dress, flower headpiece and oversized bouquet looks beautiful, it is picture perfect! Emma wore our Carmen Ivory sparkly t-bar sandal. She says: "I've also worn them to other events this year, they are so comfy!" We are so pleased to have been part of such a lovely wedding and for another happy bride! Sharice and Matthew Hartley were married on the 6th of September 2014 at the beautiful Raithwaite Estate, Whitby. Sharice: "My Kunja White heels were the most beautiful and comfortable pair of shoes I have had the pleasure of wearing. I have M.E. and have a lot of pain to contend with on a daily basis so heels are something of a rarity for me nowadays but these heels were still comfortable when I took them off after about 15 hours of wearing them. It's really hard to find comfortable wedding heels that look so beautiful! The grounds of our venue was extensive so we had a lot of walking to do and our 1950s rock and roll band at the evening reception meant a lot of dancing so these heels were well and truly tested for the comfort factor! But as well as being the comfiest heels ever they were truly stunning and got lots of compliments." Sharice wore our Kunja wrap around peep toes with a glittery heel. 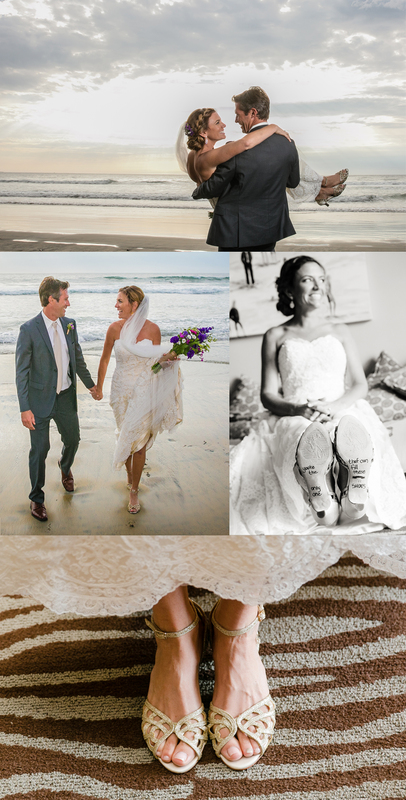 Summer 2014 was a busy bridal season and another of our lovely couples are Emma & Chris Turner. Their wedding was Friday 6th June 2014 at Iscoyd Park in Whitchurch Shropshire. They were lucky and had an amazingly sunny day. Emma wore our Carmen Ivory sparkly t-bar sandal and to quote her: "My Carmen Ivory Shoes are my favourite shoes ever!! It was very warm and the shoes were the most perfect choice. They were airy so I felt really light in them.... but so pretty and vintage looking at the same time. I managed to dance the whole night away in them with all of my old school friends, which is a memory I will never forget." The wedding was vintage/great gatsby inspired. Emma wore a beautiful Jenny Packham Willow Dress and "borrowed" art deco style chandelier earrings. One of my favourite photos is of her daughter, she loved the shoes too and kept trying to put them on! What a cutie, love the heart shaped sunnies, must get some stat! 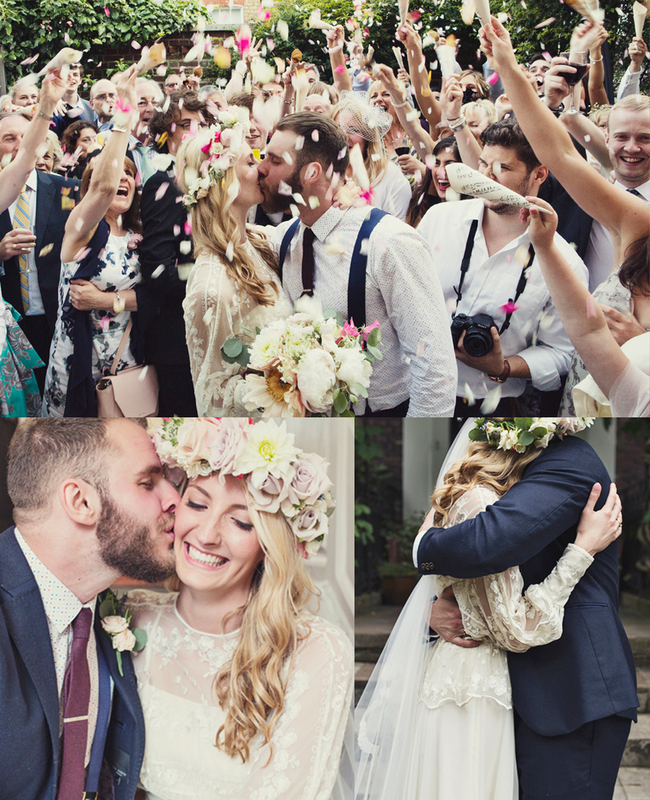 On the 23rd August 2014, Jen & Paul had their wedding at the Adam and Eve in London. Jen: "Now, while I am yet to put our wedding photos in an album, I have put my shoes in a box frame & hung them on the wall. Perfect shoes for a perfect day." Nicola and Ros Gibson tied the knot on the the 28th March 2014. The setting was Cripps Stone Barn in the Costwolds. This lovely country wedding offered some beautiful & dramatic scenery as backdrop for their stunning photos. Nicola wore our elegant Carmen Cream sparkly t-bar sandal. 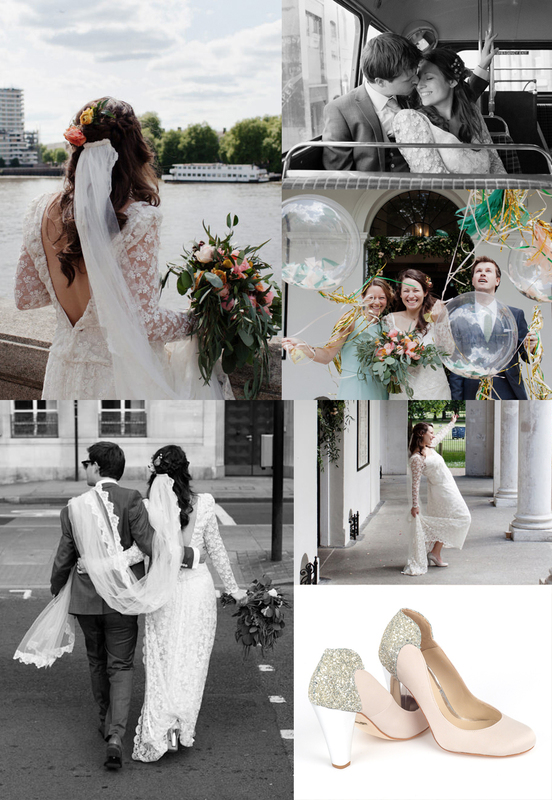 "I stumbled across the beautiful Love Art Wear Art shoes whilst obsessively perusing instagram for all things wedding. I quickly searched for the website and immediately loved the range of shoes on offer. I was conscious that I wanted to try various different styles before committing to one. Nicole was so accommodating from the start; she sent me various alternative photos of the styles I liked and advised on how the shoes fit. Nicole really did make the process easy; her customer service is second to none. Furthermore, her shoes are so beautiful and just that little bit different whilst still looking elegant and classy." This lovely couple is Tony and Gaebrielle Derham. They were married on 7 February 2014 in a sunny and gorgeous Watsons Bay, Sydney Australia. Gabrielle looked everywhere for the perfect shoes and we are so pleased that she chose Love Art Wear Art to be part of her fabulous wedding day. Gabrielle wore our Carmen Ivory sparkly t-bar sandal. This happy couple is Sonia and Mark. They were married in October 2013 in Glasgow's Newlands South Church. The reception was held at the city spa hotel Blythswood Square. Sonia: "We had a fabulous wedding and the shoes were just perfect!!" Their wedding was also features in Stylist online magazine so you can see the full cover here for some amazing inspiration! Sonia wore our lovely Scarlett Cream t-bar dance shoe. Christine & Jeff had a wonderful romantic wedding in this picture perfect setting. 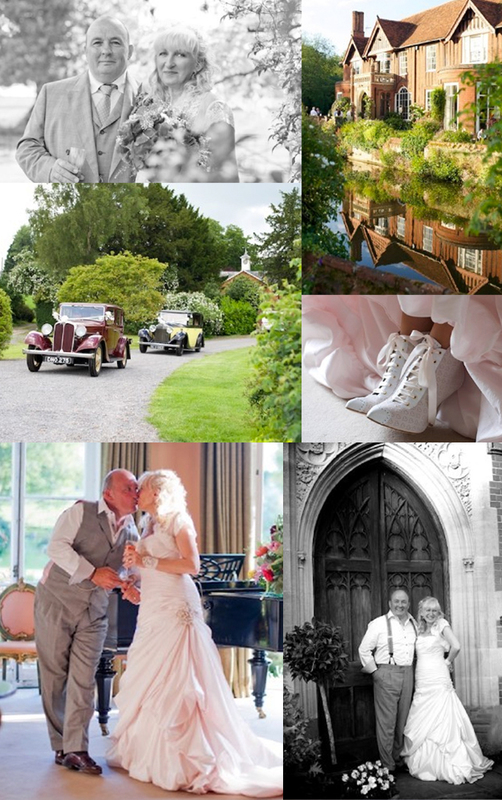 The wedding was on 7th June 2014 and they got married in Hartest Church and the reception was at Boxted Hall, Suffolk. 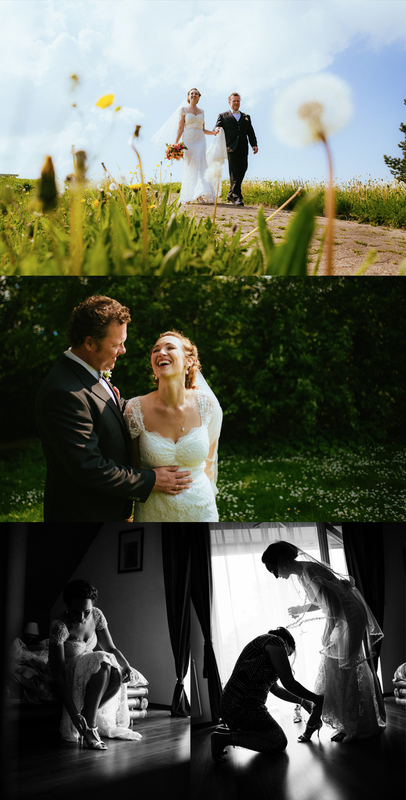 Surrounded by bright green country side and flooded with sunshine, they had a wonderful day! We love the soft pink tone of Christines dress and our cute Inessa heart punch victorian lace up ankle boots looks just perfect with it! 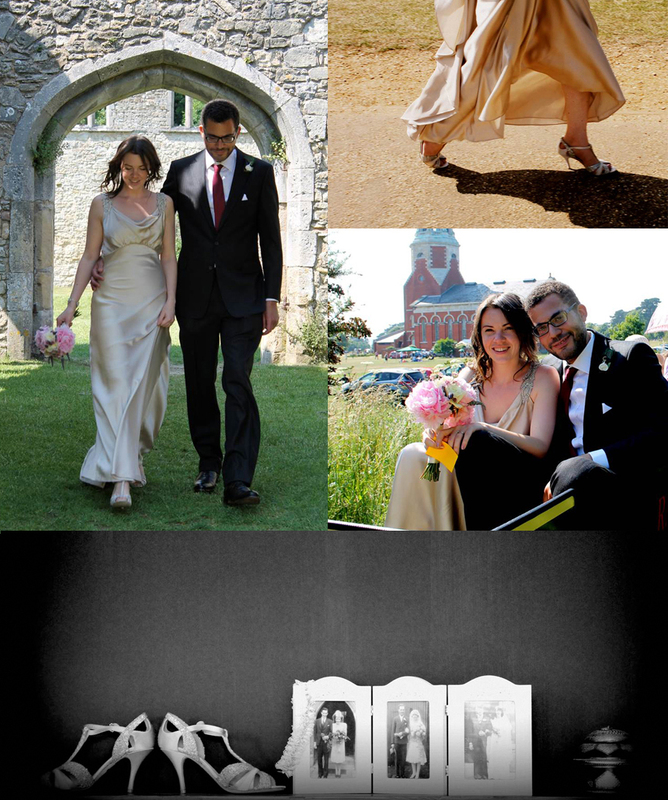 Mrs Beccy Austin and Dr Ed Austin married on the 6th of July 2013 and the weather was amazing! The ceremony was in St Edward's Church in Netley Abbey, Hampshire and the reception at Royal Victoria Country Park in Netley. Beccy looked stunning in her long, floaty, ivory dress. Our Scarlett Ivory t-bar dance shoe was the perfect fit! Beccy: "The shoes were amazing. So comfortable I wore them right up to the last bit of the night. I still love them and I'm hoping to wear them to my sisters wedding in a months time. Thank you so much!" We love the bottom photo of the bridal shoes, garter and family photos on the mantle piece. Lots of family history and love in one photo! It shows the shoes, the garter which her Granny handmade out of lace, and family wedding photos. Parents, grand parents and great grand parents! Catherine & Stephen got married at Hampton Court House, East Molesey on the 20th December 2013. The loose theme was vintage Hollywood glamour... so our Scarlett Ivory was perfect for the occasion. What a beautiful and old school glamorous wedding! Jade Lamson (now Sheridan) and Christopher Sheridan had a very creative and fun wedding. The wedding was in August 2014 at Gabbinbar Homestead in Toowoomba, Queensland, Australia. Gabbinbar means peace. The theme for the wedding styling was Autumn Charm - Garden Party - Celebration of Love. The beautiful outdoors setting is perfect for this vintage inspired wedding and all the special touches adds a really individual sense of style. 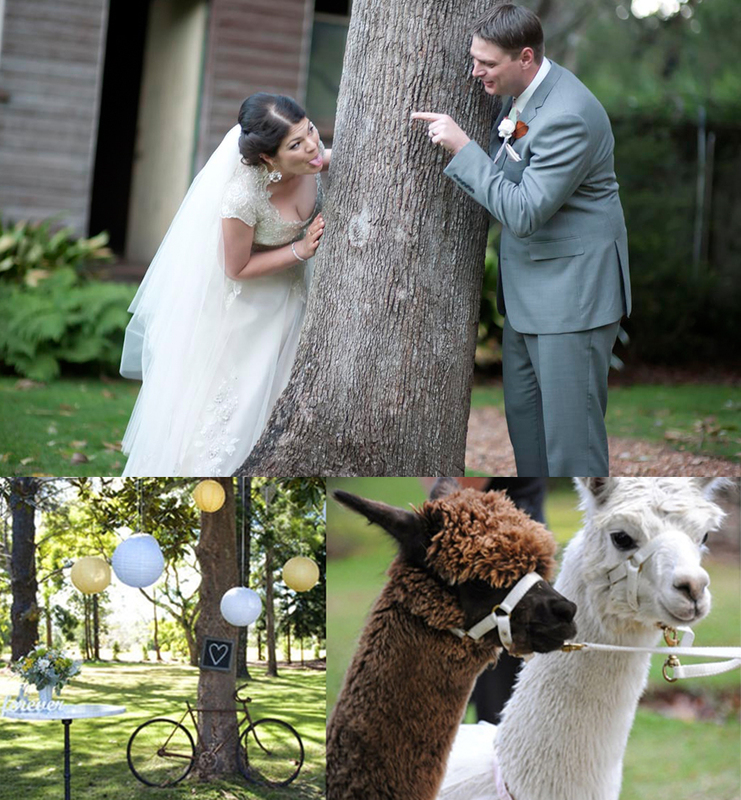 We love the wedding lamas and the heart shaped group shot below! Jade wore our Scarlett Cream t-bar dance shoe. Melita Tomic & Tom Griffiths live in Western Australia. The wedding was held on April 5th, 2014 in Perth. The ceremony was at St Denis Church and the reception at The Brown Fox. Melita wore our Scarlett Cream t-bar dance shoe. I am in love with the setting and the old school touches, from the pretty wedding invitations, her lovely beaded gown to the bold & bright flowers. A day full of colour and fun! At Love Art Wear Art we create beautiful, limited edition shoes. We care about comfort, quality and unique design.